When Janice and Beth asked me to submit ideas for their Modern Medallion Workbook they were putting together, I was a little stumped as to what I would do. I had never seriously thought about making a medallion quilt, let alone designing one. It was a challenge, and I love challanges. My life was really hectic at the time, and I wasn’t sure if I could fit it in, but i’m glad they convinced me to send along some sketches. I designed Graphical to be both modern and minimal. 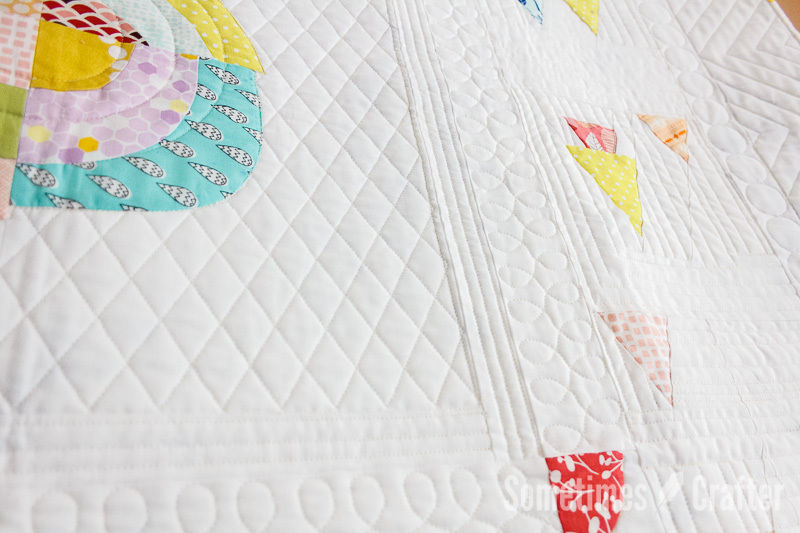 I love lots of white background in my quilts, and with a medallion quilt I saw all of that background as a great way to add in fun quilting patterns. With a medallion, all of those rounds of the quilt gave me a nice structured area to quilt different patterns. The quilt became a medallion quilt not just for it’s piecing, but it’s quilting as well. Each round of the quilt has a different quilting – circles, zigzags, horizontal lines, cross hatching, etc., and I think that just adds to the fun of it. In all honesty, I think the quilting really made this quilt. Something else I really liked about this quilt (other than the fact that it goes together pretty quickly) is that there is no time to get bored with it. I think that’s what great about medallion quilts in general, each round is something different to keep you excited for what comes next. I feel like I took that a step further, in that there are lots of different piecing techniques in this quilt. 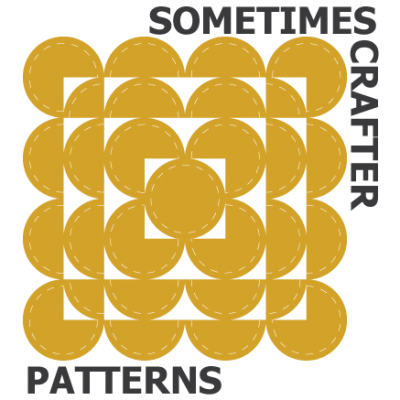 The center circle is pieced improvisationally, but I approach it differently from what i’ve seen done before. I have given steps on how to cut your curves improvisationally and still have them be big sweeping curves if you so desire. So much of the improve curve piecing results in mostly straight lines, but with the method for this circle you can have nice drunkards path curves. 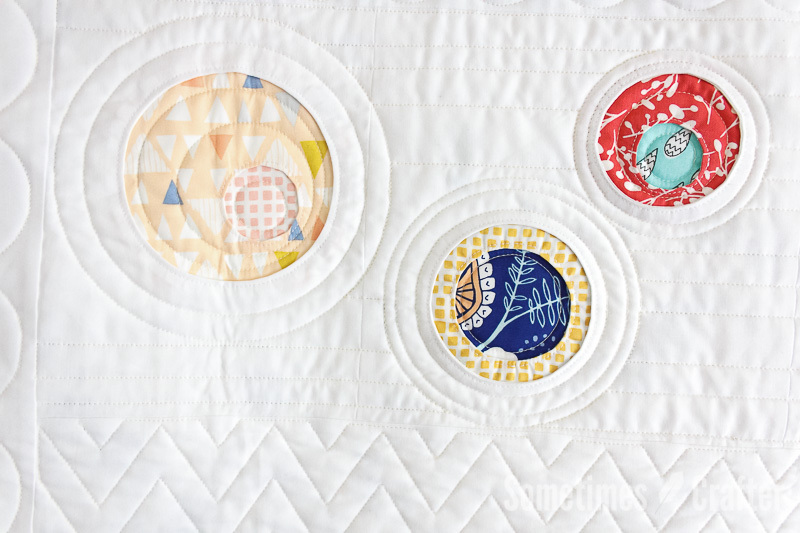 The quilt also incorporates reverse applique methods that result in perfect circles, and has the added fun of layering a few that you can offset or center, whatever you choose. One of my favorite borders is the falling triangles, which are foundation paper pieced for perfect points. 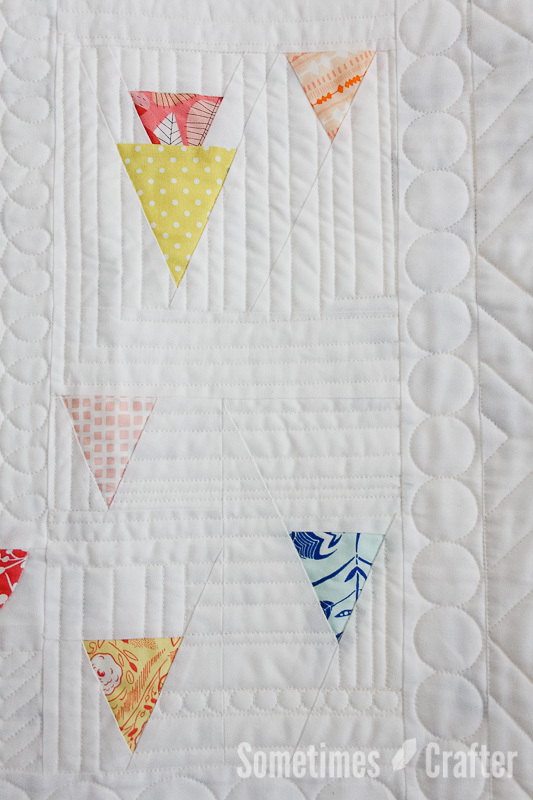 The larger borders on the quilt are simple straight piecing, with the chevron piece assembled on an angle. If you needed a smaller quilt it is so easy to just leave both those borders off, of combine other borders from different quilts in the book for a whole new look. 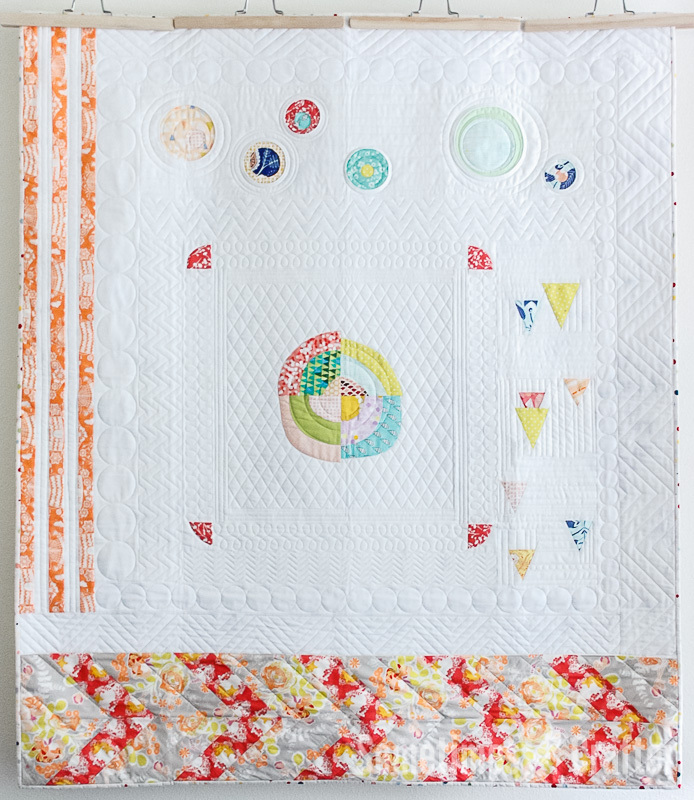 A great feature of this book is the “Make It Yours” section that helps guide you in making your own medallion quilt using borders from different quilts throughout the book. It truly is a “workbook” and a great book to have on your shelf. There are really so many great projects in this book, and all of the contributors are talking about their quilts in this blog hop that goes through next week, so be sure to check out everyone’s quilt to see just how amazing they all are. Now let’s do a giveaway! 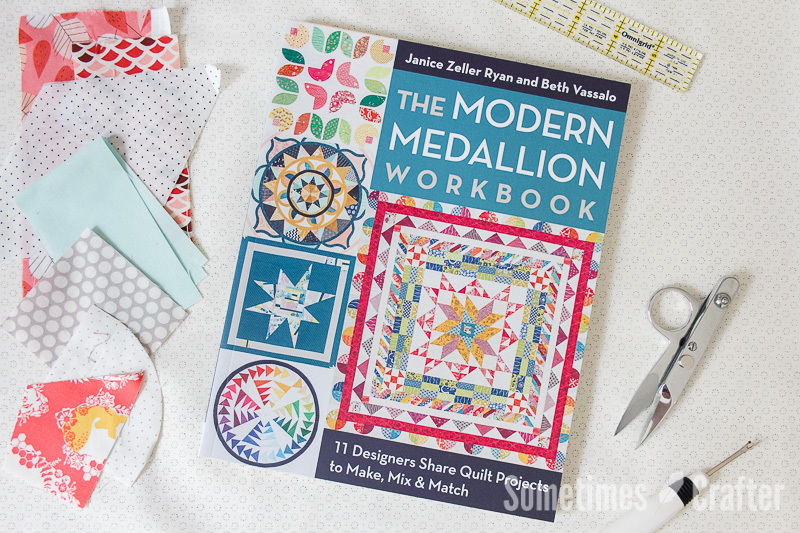 C&T is sponsoring a giveaway for a copy of The Modern Medallion Workbook by Janice Zeller Ryan and Beth Vassalo to one lucky reader. US entries have a chance to win a physical copy of the book, and internationally winners will receive a digital copy. To enter, just click ENTER on the Rafflecopter giveaway below – so easy! 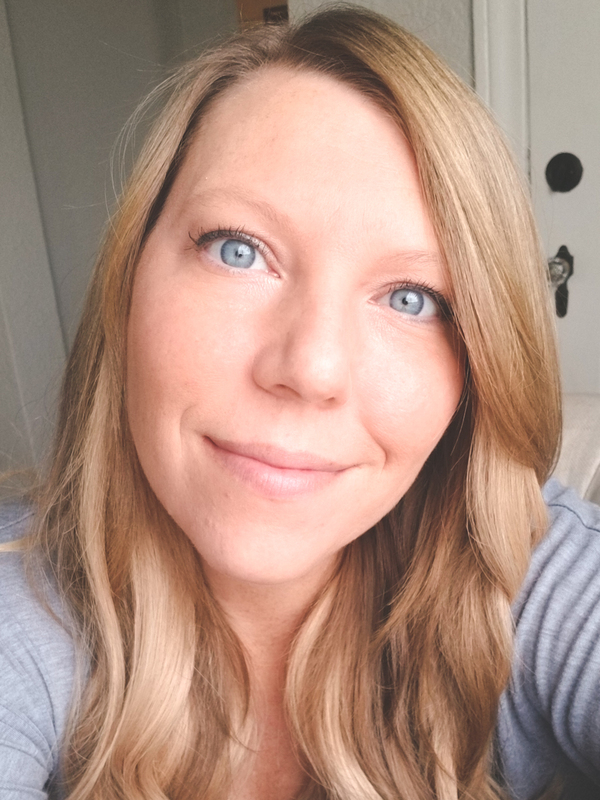 The giveaway thing on your blog isn’t working. Nothing happens when you click on it. I like the quilt you have posted here it’s very serene looking. Thank you for the giveaway! Sorry typed the name wrong. The first time. Lovely quilt. I’m not able to enter Rafflecopter once I log in. The rafflecopter isn’t working on my end, but I LOVE your medallion! so beautiful. I love this quilt! Having trouble with the Rafflecoptor though, is it not open yet? It’s not giving me any options or anywhere to click. Can’t find the “Enter” button on the Rafflecopter! Lovely quilt & the book sounds great. I wasn’t able to get the raffle copter to work either. Ditto, no raffle copter here either. Thank you for the inspiration, and for sharing your process! I’m excited about this new book! Great book, wonderful techniques and project ideas. Thanks for the chance to win. Another beautiful quilt. Great idea for a workbook. Thanks for the giveaway. Pingback: Buchvorstellung "The Modern Medaillon Quilt Workbook"